As previously mentioned, the Pathé Marignon projector had a rudimentary speed control system provided by a wire-wound potentiometer in series with the motor. aboveAfter disassembly of the old supplementary chassis, I noted that this potentiometer was marked “V. ALTER FRANCE”, which suggests my father had retained this speed control potentiometer from the original unmodified projector. Sturdily constructed from metal, ceramic and some kind of varnish, this is an example of a component from the pre-plastic era. Not surprisingly they didn’t mention ancient 9.5mm film projectors! But the Pathé Marignon did have a universal (brushed) motor, so this controller seemed a good match. “There are 12 pulses during each half-cycle, so the motor receives a more continuous stream of current compared to when driven via phase control. As a result, the motor operates very smoothly over the whole of its speed range. I anticipated that this new hi-tech speed controller would achieve much better speed regulation than the primitive potentiometer method. So I ordered the kit from Jaycar Electronics and, with soldering iron in hand, commenced construction. 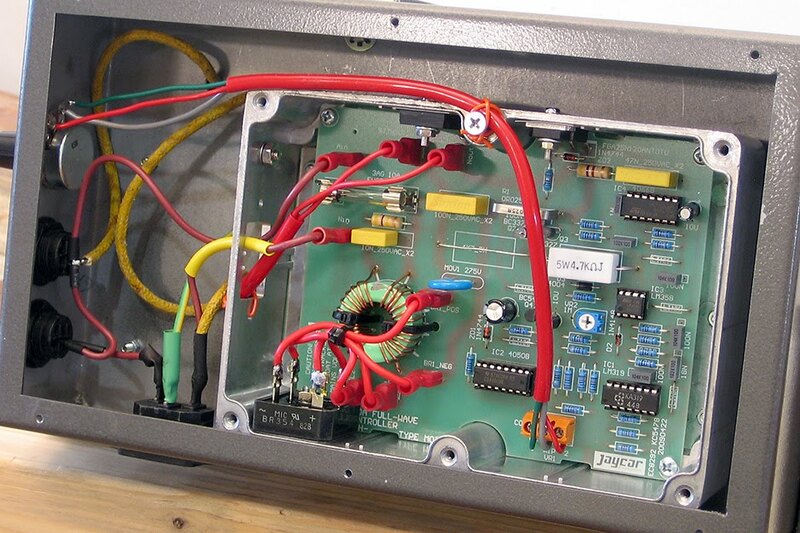 One minor issue was that this electronic speed controller was designed to operate on 230VAC, whereas the French-designed Pathé Marignon operated on 110VAC via an external step-down transformer. I contacted Silicon Chip Magazine and they advised that the circuit should work just as well at 110V if one resistor was replaced with a wire link, which was done. 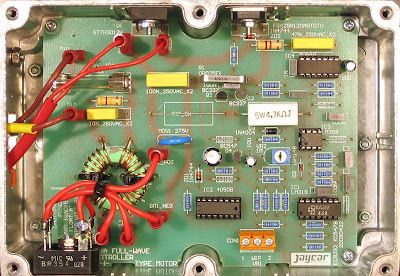 The speed controller printed circuit board (PCB) was designed to fit inside a cast aluminium box which doubled as a heatsink for the power transistor (IGBT) and the bridge rectifier. It made sense therefore to construct the controller in this box as designed, and then mount the entire box inside the new projector base. 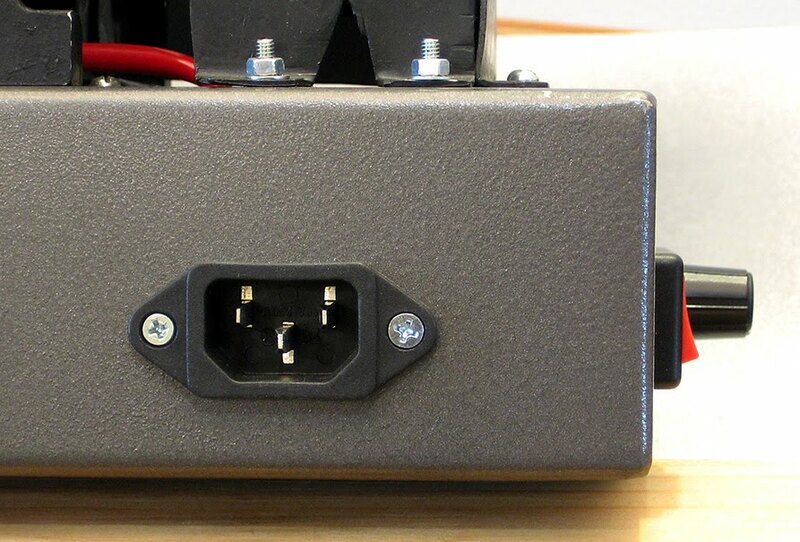 aboveCloseup of the new electronic speed controller PCB mounted inside the cast aluminium box. The power transistor which switches the motor current is visible at the top of the photo (also a power diode), mounted onto the aluminium box which serves as a heatsink. A bridge rectifier which supplies DC for the electronics is visible at bottom left. 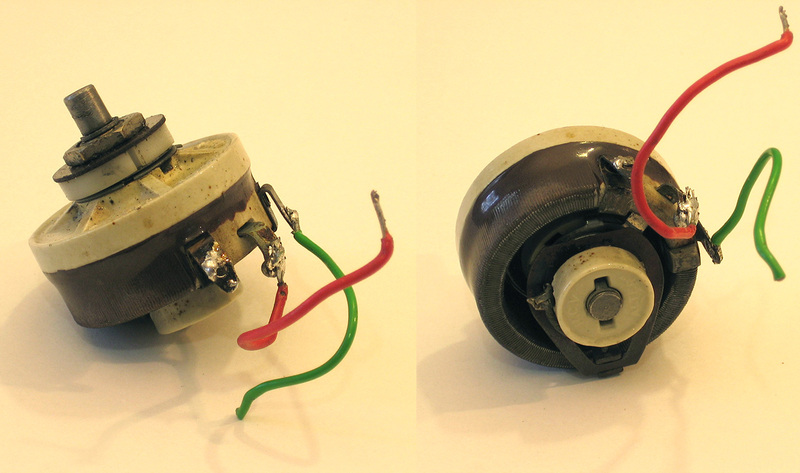 The wire with the red plastic sleeve exiting through the hole on the left leads to the motor. Building a kit like this is not difficult. It just takes care and patience, the right tools and checking and double-checking that no mistakes have been made. Once the PCB was complete and checked, it was mounted into the aluminium box and then fitted inside the new projector base. The power inlet socket, new switches for lamp and motor and a new speed control potentiometer (which connects to the electronics, not directly to the motor) were then fitted into the pre-milled holes in the new steel base. It was then just a matter of running the required wiring to join everything up. The lamp and lamp-house runs very hot, so normal plastic-insulated wire would not be suitable. Fortunately I had found in my father’s “wire collection” some high temperature insulated wire originally purchased in the 1960s. The insulation may have been made of the now dreaded asbestos, but it was in good condition and posed no danger and turned out to be perfect for the lamp wiring. aboveThe new speed controller inside the projector base with wiring all in place. At left is the yellow high temperature wire for the lamp. 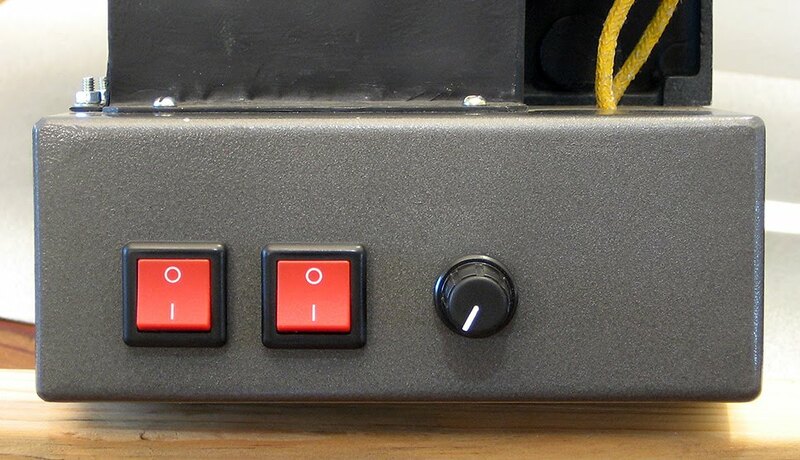 aboveThe rear panel of the new projector base, showing the controls. Switches for motor and lamp at left and speed control know on the right. Simple and sufficient. Having carefully completed all the wiring and testing it with a digital multimeter, it was now time to run a live test on the new controller connected to the cleaned and reassembled projector motor. Fingers crossed, I plugged the unit into the 110v transformer, switched it on and voila!, it worked perfectly, with excellent control of motor speed, even down to very low speeds. aboveThe power inlet socket is a standard IEC type but in this application it must NOT be connected to 230VAC. This would quickly burn out the projector motor. It has to be run from 110V only. The next post will cover re-assembly of the projector mechanism.